We are updating the website to include our fall foliage rides and some new price points for this fall. Weekends are very busy and book up fast so make sure to book early through our reservation form at www.chfmaine.com/reservation. 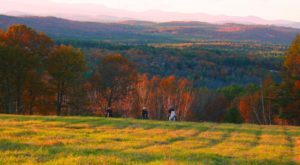 The Quaker Ridge ride is 4 hours long with a picnic lunch at the top of a 360 degree view of the the Presidential Range and the Sebago Lakes Region. It can be reduced to a two hour ride with picnic which requires us to bring the trailer and load the horse and riders to come back to the farm. 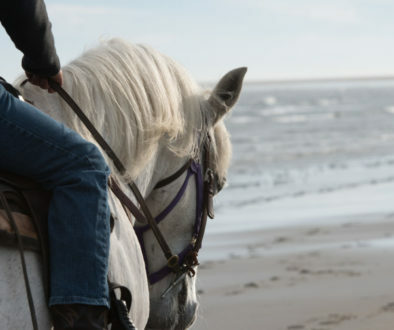 This is not a guaranteed private ride because we cannot do more than one at a time and we do try to match riding ability where ever possible. This ride costs $400 per couple with a discounted rate during weekdays if your group is more than 4 people. A $50 non refundable deposit is required to hold the reservation. The deposit can be used as a credit toward another ride as long as we have 24 hrs notice of the cancellation. Our Fall Foliage Sunset ride is now a full hour and sometimes a few minutes longer. 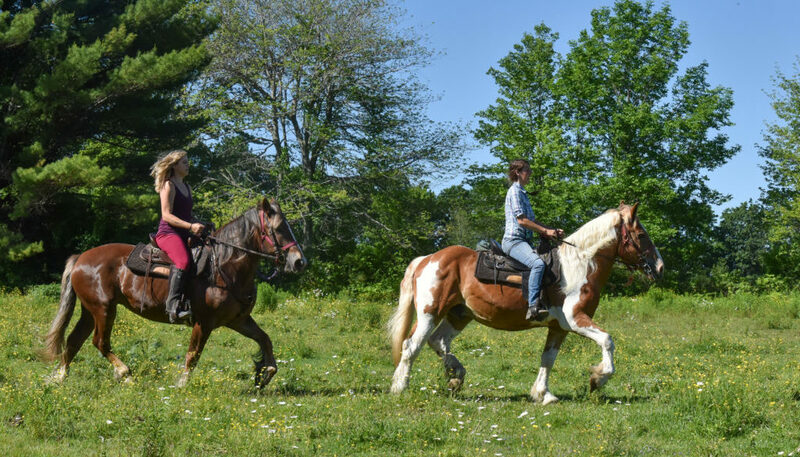 This ride offers a few opportunities to trot and possibly a canter as long as the whole group is comfortable doing so. It is, as always, the guide’s discretion. We stop to take pictures at the top of the hill during sunset just a few minutes before returning to the farm. This ride costs $200 per couple, a single can go but it still costs $200 unless we add the single onto an existing ride. 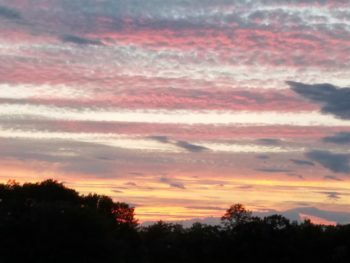 The time varies depending on sunset, leaving approximately one hour and fifteen minutes before official sunset that day. A deposit is required for this ride of $50 which is non refundable except in the first 24 hours after the deposit is received. The deposit can be used as a credit toward another ride in the future. 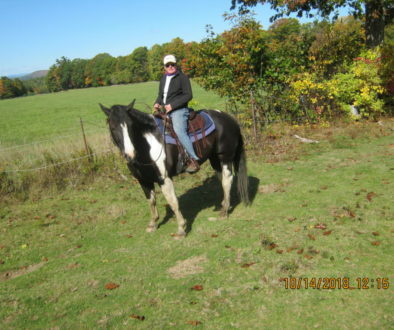 Fall Foliage Beginner ride is our classic 45 min to 1 hr beginner ride through the woods and fields. You won’t miss a thing because the colors are glorious on the hill and the view of the Presidential range is a rainbow. This ride is $55 per person and can be reserved between 10 a.m. and 3 p.m. seven days of the week. Our Two Hour Private ride is $225 for a couple on weekdays and $350 for up to four people. On weekends the price is $350 for up to four people. Some special rates apply if your group is over four people. This ride is specifically for groups that want to ride at a pace that is enjoyable and comfortable for everyone. We won’t mix groups but we also can’t guarantee that a large group will all have the ability and communication skills with their horse to canter in a large group. A deposit is required for this ride of $50 which is non refundable except in the first 24 hours after the deposit is received. The deposit can be used as a credit toward another ride in the future. 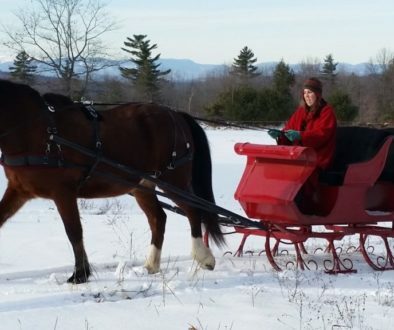 Our One Hour and One and a Half Hour Intermediate rides are still available, the one hour is private for $200 minimum up to two people and the one and a half hour is $200 but other riders can be added. We do our best to match riding abilities but it is not always possible. These rides generally go out between 10 and 3 pm seven days a week, availability is limited on busy weekends. A deposit is required for this ride of $50 which is non refundable except in the first 24 hours after the deposit is received. The deposit can be used as a credit toward another ride in the future. Sunset Guided Trail Ride What Does Guides Discretion Mean? Beach Ride Season is here!